Yesterday afternoon Ben and I biked up to Gloucester where we joined other friends to take in the annual Greasy Pole Competition (read more for Wikipedia). Despite the forecast of thunderstorms, we enjoyed a very pleasant weather for our ride and even after missing our turn in Manchester by the Sea, we still managed to get there in time to watch a good part of the competition. I spent last Thursday and Friday in Woodstock, VT with a group of people invited by the Orton Foundation to discuss their "Heart and Soul" approach to planning. The invitation seemed to come out of the blue a few months ago, since I was aware of the Orton Foundation's work but not involved with them at all. Apparently they had seen my work on place blogging and wanted to have someone in the group who had experienve thinking about place and technology, but I went into the gathering a bit unsure of what I would have to contribute. The Orton Family Foundation works to build vibrant and enduring communities. We help small cities and towns articulate, implement and steward their heart and soul assets so that they can adapt to change while enhancing the attributes they value most. The Foundation promotes inclusive, proactive decision-making and land use planning by providing guidance, tools, research, capital and other support to citizens and leaders. "The need for a new approach is predicated on our belief that land use planning in America has yeet to live up to its full potential to engage a broad base of local citizens in defining and shaping the future of their communities. The traditional quantitative approach to planning generate and use important data about demographic and economic shifts, but frequently fail to account for the particular ways people relate to their surroundings, and usually ignore or discount the more nuanced information like shared values, beliefs, and quirky customs that strengthen community"
I'm excited to be participating in the 21st Annual Bikes Not Bombs (BNB) Bike-A-Thon on June 8th, riding 62 miles to raise money for this fine organization that promotes biking for transportation and community development. BNB is doing many things right: recycling donated bikes, training city kids to repair bikes, sending bikes to developing countries and fighting to make the city more bike-friendly. What's more, BNB has become the local bike shop that go to when I need repairs. Biking may not be the answer to all the worlds problems, but it is an increasingly important lifestyle choice that allows many of us to get where we need to go and to contribute to the health of our communities and the environment. I'm looking for people to contributing to BNB's work by supporting my ride. If you're able to contribute something, I would really appreciate it. Or, if you are local and want to drop it off at my house, or don't mind mailing it, your gift will go farther as a check or cash (BNB pays a 7.35% processing fee for each online donation). Please make the check out to "Bikes Not Bombs", put "Tim Lindgren BAT08" in the memo line, and mail it to me at the address below (or put in my mailbox). Please send me an email to let me know if you are making a donation this way so I can record it properly. Please make your donations before June 1st. Please forward this email to others whom you think would be interested in supporting Bikes Not Bombs. 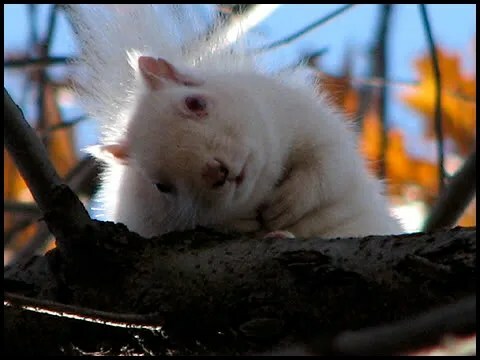 Today Cathy sent me alink to this amazing photo of an albino squirrel near Jamaica pond taken by cottenmanifesto and posted at Loving Nature While Living in the City. Apparently its existence dominated the lunch conversation at her work today. The life of a squirrel can be a precarious one, as I witnessed earlier this evening when I walked out of my office and was met by a red-tailed hawk standing on the sidewalk, talons firmly around a squirrel it had just killed. After a few moments, it flew away, leaving a small pool of blood on the concrete where it has been standing. These incidents reminded me of the rather conflicted relationship I've had with squirrels over the years. I got to know them quite intimately when I llved in Allston, or more precisely, when we lived together in Allson, since they occupied the walls and attic space around my room most of the time I was there. It wasn't an amicable relationship, I'm afraid; they kept me up at night, gnawned on wires, and chewed through my belongings stored in the attic, so finally I had to begin trapping them so that pest control could pick them up. Ultimately, it was the landlord's fault since he wouldn't fix all the holes in the house, and I resented being forced into this antagonistic relationship with animals that under normal circumstances I'm confident I could get along with quite well. But these are the lessons we learn, living together in the city, and I hope to have more pleasant encounters with my neighbor squirrels in the future. Yesterday I attend a JP community summit at English High (the oldest public high school in the US) sponsored by the Jamaica Plain Neighborhood development corporation, an event which helped give me a better sense of what's going in the larger JP community. I've been getting to know my immediate Stonybrook neighborhood during the last year by attending neighborhood association meetings and getting to know my next-door neighbors. But I was amazed to learn of the opportunities to get involved in JP at almost any scale, from street to neighborhood to city and beyond. There is a long history of grass-roots activism here that has helped revitalize the JP into a healthy urban neighborhood, but this success has also brought some of the problems typical of gentrification–many of the people who worked hard to improve JP now can't afford to live here and the diversity that many people value is changing as new people move in. This summit was meant to help community members share ideas about how to make JP an equitable place even as it continues to develop and change. As one of these newcomers, it's easy for me to feel like I'm part of the problem–just another bearded white guy buying a condo in a newly converted building–but the summit helped me see that I can also be part of the solution if I'm willing to understand how JP got to be the way it is and then get involved to do my part in keeping it healthy. I still have a lot to learn, but I feel lucky to be in a place that seems to be a good teacher. WHEATON — A male pedestrian who was fatally struck by a Metra train in west suburban Wheaton Thursday afternoon has been identified. Killed was Kurt Hanson, an adult of an unidentified address, according to a spokesman for the DuPage County Coroner’s office. Hanson was pronounced dead on the scene at 1:01 p.m. Thursday at the Union Pacific railroad tracks near Chase Avenue in Wheaton, according to the spokesman. The man identified by the coroner’s office as Hanson was struck by a train about 12:30 p.m. at Chase Street on the Union Pacific Railroad, according to Wheaton Police Deputy Chief Tom Meloni. “At this point, it remains under investigation whether or not his death was accidental,” Meloni said Thursday. A westbound Metra train struck the man, according to a Wheaton police release. Two westbound Metra trains were delayed after a body was found on the tracks near west suburban Wheaton, according to Metra spokesman Tom Miller. The Metra is the commuter train that we used to ride into Chicago from Wheaton College when we were students there, and Kurt was Andrew’s high school friend who hang out with us fairly often because he lived in the area. He became a fixture in our group, the guys who lived together our senior year, even after we went our separate ways and only gathered for the occasional reunion. Kurt had a way of floating in and out of our lives, showing up unexpectedly to just hang out, whether in our dorm rooms, in my apartment in Chicago after graduating, at Andrew’s 30th birthday in New Haven. Last time I hung out was in Chicago about a year and a half ago when we went to Moody’s for dinner and Heartland Cafe, near where I used to live in Roger’s park. Yesterday I was rode to my regular dissertation coffee shop, Sweet Finnish, on Centre St., only to see that it wasn't opened yet. In the interest of time, I decided to continue down to JP Licks, my other writing spot. Just I was leaving, one of the Sweet Finnish regulars came in and informed me that it had suddenly gone out of business. It's always sad to see a good coffee shop go down, especially when it had become part of my writing routine. I liked the quiet, Scandinavian feel to it, with the smells of the bakery in background. JP LIcks is a great place as well, but I'll miss having the chance to enjoy both.